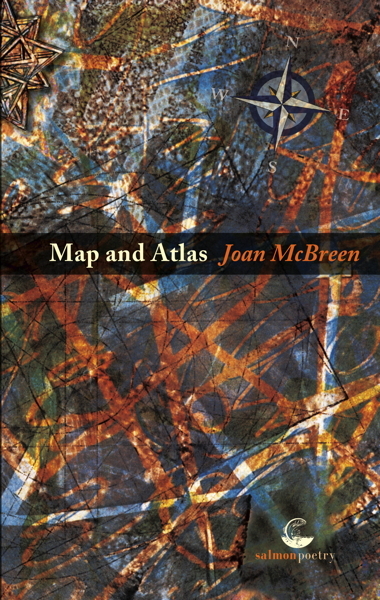 Joan McBreen’s Map and Atlas comes to us from a confluence of two great rivers; two streams of thought, the one private, the other public. Her map-work has been achieved through observation and memory, through a restlessness in nature and clear-headed observations made through windows flung open. of great emotional clarity and honesty, a poetry at once intimate and universal, from a poet who goes from strength to strength with every year that passes. Joan McBreen is from Sligo. She divides her time between Tuam and Renvyle, County Galway. Her poetry collections are: The Wind Beyond the Wall (Story Line Press, 1990), A Walled Garden in Moylough (Story Line Press and Salmon Poetry, 1995), Winter in the Eye – New and Selected Poems (Salmon Poetry, 2003) and Heather Island (Salmon Poetry, 2009; reprinted 2013 & 2016). She was awarded an MA from University College, Dublin in 1997. Her anthology The White Page / An Bhileog Bhán – Twentieth-Century Irish Women Poets was published by Salmon in 1999 and is in its third reprint. She also edited and compiled the anthology The Watchful Heart – A New Generation of Irish Poets – Poems and Essays (Salmon, 2009). Her poetry is published widely in Ireland and abroad and has been broadcast, anthologised and translated into many languages. Her CD The Long Light on the Land – Selected Poems, read to a background of traditional Irish airs and classical music, was produced by Ernest Lyons Productions, Castlebar, County Mayo in 2004. Her most recent CD is The Mountain Ash in Connemara – Selected Poems by Joan McBreen, read by the poet to new arrangements of Irish airs and original music by composer Glen Austin, performed by the RTÉ Contempo Quartet. 2015 saw the publication of a limited edition broadside, The Mountain Ash, with an original etching by the artist Margaret Irwin West alongside Joan McBreen’s poem, ‘The Mountain Ash’. Set in letterpress and hand-printed by Mary Plunkett of the Belgrave Private Press, Dublin. Published by Artisan House, Connemara. 150 copies signed by artist and poet, numbered and dated. She has given readings and talks in many universities in the USA including Emory, Villanova, de Paul (Chicago), Cleveland, Lenoir Rhyne, N.C. and the University of Missouri - St. Louis. In 2010 she undertook a six week reading tour of Nebraska, Iowa and Alabama and in 2012 she read at the University of St. Thomas, St. Paul, MN and at the University of Minnesota, Duluth. Her most recent US reading was at the 2017 American Conference of Irish Studies (ACIS South), University of Kentucky, Lexington. 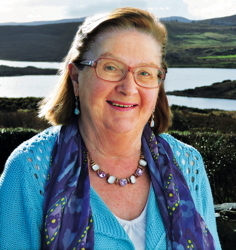 Joan McBreen has been involved for many years with Irish literary festivals such as the Yeats International Summer School, Clifden Arts Week, Listowel Writers’ Week and the Cúirt International Festival of Literature, Galway. She is also a member of the Board of Poetry Ireland.